This article is an overview of the RealHighway (RHW) Mod and its development history. For documentation on the RHW, see the NAMdoc page on the RHW. The RealHighway Mod (formerly Rural Highway Mod), or as it is perhaps better known, the RHW, is a modification produced by the NAM Team. The RHW is optional component included in the Network Addon Mod (NAM) package. It enables a completely new network that Maxis left unfinished (known internally as DirtRoad), formerly part of the NAM ANT Plugin. Through Override Technology, wider variations of this network, allowing increased capacity, can be created through draggable means, along with Modular Interchange System (MIS) ramp segments. Over the years, it has expanded from merely being a network intended for primarily rural usage to a largely modular, all-purpose highway. Through the release of RHW 5.0 and NAM 30 in September 2011, the RHW existed as a separate-download NAM Component Plugin. As of the NAM 31.0 release of March 2013, which marked the return to a "Monolithic NAM", the RHW ceased to exist as a separate download, and became fully integrated as an option in the NAM installer. The project has remained one of the most active and followed transit modding projects in the community, and is still in development one decade after its founding, serving as the research-and-development hub within the NAM ecosystem. The RHW project was started as the Rural Highway Mod by qurlix and nooneatall in August 2005, based upon initial work by Teirusu, with an initial "public alpha" release, Version 1.2 (also variously called 0.12 and v12--the decimal point has continually moved around during the history of the project), coming in November that same year. qurlix had also planned a couple of other updates at various points, Version 1.5 and Version 1.7, neither of which was released. Tarkus became involved in the project in October 2006, and took over the project in March 2007 after qurlix's departure. He released a small update, Version 1.3 in April 2007, largely to address compatibility issues between NAM Version 20 (December 2006) and RHW Version 1.2, something which the unreleased Version 1.7 was originally intended to fix. With the release of Version 1.3b in June 2007, the RHW became an official NAM Team project. For the Version 2.0 release, which debuted on January 1, 2008, the RULs for the mod were completely re-written, to change the RHW from a "side-by-side" override to a Starter Piece setup, similar to the then-new Draggable GLR system and Street Addon Mod. This coincided with the incorporation of the Modular Interchange System, which allowed for true RHW interchanges for the first time. During development on Version 2.0, Tarkus expanded the project development team to include Shadow Assassin (who had provided some graphical work for Version 1.3a and 1.3b) and, for a brief time, texture artist rickmastfan67 and Big Dig modeler blahdy. A new version, Version 3.0, was released on January 14th, 2009, coinciding with the NAM 24 release. The new release features the long-awaited RHWs, up to the RHW-10S (five lanes per direction, separable), Elevated RHW-4 and MIS Ramps with models by Swamper77, smoncrie's RHW-2 and RHW-4 bridges, and over 60 puzzle pieces and numerous draggable additions, including the sought-after MIS-to-OWR transition. It also featured a radically re-designed texture set from Tarkus and ardecila. Version 3.2 in March 2009 fixed some path files in Version 3.0, coupled with some RUL fixes included in the NAM 25 release. The next version, Version 4.0, was released in May 2010, as part of the NAM 28 cycle. Several new developers joined Tarkus and Shadow Assassin for this release, including Blue Lightning, choco, jmvl, deathtopumpkins, mrtnrln, toja and mtg. The default texture set was revamped again by Tarkus for Version 4.0, and blends the "traditional" RHW look with the scaling improvements introduced in the Version 3.0 texture set. The flagship features of Version 4.0 were Blue Lightning's FLEXFly (Flexible Flyover) system, a 90-degree Elevated MIS Ramp curve in helper piece form, allowing for networks to be dragged under it to create a flyover setup, along with the introduction of Fractional Angle networking by Shadow Assassin. After Version 4.0, the project was planned to move to a smaller-scale release format, dubbed the "4.x Series". However, the series only got as far as Version 4.1, in August 2010 (with NAM 29), which incorporated improvements to the FLEXFly system, a new ground-to-elevated MIS Ramp transition, and bugfixes, among other things. swamp_ig joined the development group in June 2010 as a modder and modeler, along with riiga later in the year. In October 2010, jondor released a mod to allow RHW systems to appear on the Regional Transport View, a feat long deemed impossible. 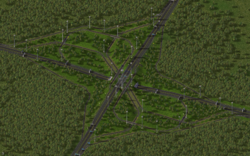 The release that was originally supposed to be Version 4.2, the second 4.x series release, was later renamed Version 5.0, because of the substantial amount of content added over its yearlong development cycle, including another revamp of the default textures, a Flexible Single-Point Urban Interchange system (FlexSPUI), greatly improved functionality for wider RHWs, the introduction of the Double-Decker RHW (DDRHW) and numerous new cosmetic pieces and ramp interfaces. Version 5.0 was released in September 2011, alongside NAM 30. While the initial plans after Version 5.0 included going to a 5.x-series of releases, a couple of major decisions by the NAM Team changed those plans. The first was the switch away from the so-called "Modular NAM" and "Component Plugin" paradigm to a "Monolithic NAM". As a result, the RealHighway ceased to exist as a separate entity and became a part of the NAM Core itself, beginning with NAM Version 31. In addition, the NAM Team determined that the existing RUL/IID structure of the RHW was hampering development efforts, and as such, a massive reorganization of the "under the hood" aspects of the mod was undertaken, an effort nicknamed Project 57 (or "P57", because of its shifting of RealHighway content into the 0x57###### Instance ID range), to make the mod more internally consistent. 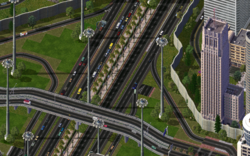 Additionally, this entailed a complete re-write of the RUL2 backend, with the goal of ultra-stabilizing the networks, and prepared the mod for the initial phases of the Multi-Height System, a 5-level approach designed to allow complex modular stack interchanges with the RealHighway. Due to the scale and complexity of this undertaking, Project 57 development has occurred in phases, or "marks". Project 57 Marks 2 and 3 coincided with the followup NAM releases in the 31.x-series, Versions 31.1 and 31.2, both released in 2013, which incrementally improved and streamlined the initial version. The Version 31.0 release was originally planned to see a complete revamp of FLEXFly, moving it from a 4x4 footprint to a smoother 5x5 layout, and the addition of flyovers at all 5 levels and 2-lane setups. However, due to time constraints and lack of personnel, this expansion was put on hold for a future NAM release, and the existing 4x4 setup was retained as a stopgap "legacy" feature, with no plans to further develop or improve it. The new FLEXFly specs, including the addition of 45-degree setups, with revised models by eggman121 and code by memo, were incorporated in NAM 33, though limited to L0-L2, due to diagonal instability with the L3 and L4 networks. Other additions to NAM 33 include the Expanded Draggable Ramp Interfaces (EDRI)/FLEXRamp project, spearheaded by GDO29Anagram, in concert with a major expansion to the repertoire of ramps for all elevated RHWs except the L1 and L2 RHW-3, enabled by modeling work from MandelSoft and Tarkus. The Multi-Radius Curves (MRC) were also added to the NAM 33 release by eggman121. A minor expansion to the Volleyball Interchange pieces by jdenm8 was also released. Future plans entail a further shift away from traditional puzzle pieces, toward more FLEX and draggable items, with the goal of reducing the number of pieces required to build systems, while simultaneously increasing functionality. The RealHighway network as it appeared in version 1.2. The RHW network is a Highway-type Network, which means it generally does not allow access to RCI Zones. 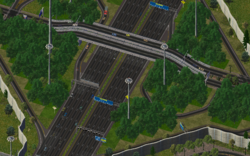 Due to the "unfinished" state Maxis left it in, it does not have Tunnel capability (One-Way Roads, Avenues or Maxis Highways must be used for workarounds). This appears to be an .exe-controlled function and is unlikely to be fixed. With jondor's mod, it can appear on the Regional Transportation View. RHWs can also be bulldozed using the Dezone tool, much like Streets, and are also subject to "auto-connect". It is also a 1-tile network, the only such Highway-type network, which makes it particularly conducive to producing Override Networks. The FLUPs (Flexible Underpass) system was expanded to include RHW components as part of Version 4.0 by Chrisim and toja. These items are located at the end of the Road/RHW button's TAB ring, located on the Roads menu. Further RHW FLUP portal designs were showcased by Dexter sometime in 2011, but have yet to be completed, due to model integration matters, and plans for a new implementation method for future FLUPs items. In the current NAM release, bridges are possible for all RHW networks, except the RHW-6C and 8C, due to those networks' triple-tile width, and the game's limitation on side-by-side bridges. The base network the RHW Network Tool produces is known as the RHW-2 (RHW, 2-lane). It is a 1-tile, 2-lane, 2-way network, much like the Road network, but with a higher capacity and speed. The precise increase in capacity and speed is dependent on the Traffic Plugin one has installed, but it is generally about 250% of that of a road. The first Elevated RHW-2 functionality was added in Version 5.0. Presently, the Elevated RHW-2 exists in two height levels: L1 and L2, and is capable of many orthogonal and diagonal overpasses. 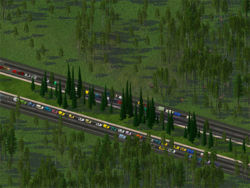 The RHW-3 is essentially the RHW version of the 3-lane Asymmetrical Road (ARD-3) in the Network Widening Mod. It was implemented in Version 5.0. It has diagonal and basic orthogonal-only intersection functionality, plus ramp interface pieces. Currently, the Elevated RHW-3 exists in two height levels: L1 and L2, capable of some orthogonal and diagonal overpasses. The RHW-3, at all its height levels, is the least-developed network in the mod at present. The Euro-RHW mod as it first appeared in version 1.3b. A large RHW interchange, made with Version 2.0, Shadow Assassin's Euro Textures and one-way-road overpasses and tunnels. The RHW-4 was the first network added to the RHW mod. While it was initially produced through a "side-by-side" override technique, since RHW 2.0, it has existed as an Override Network of the base RHW-2 network, utilizing a Puzzle-Drag Override to transform the RHW-2, into a 1-tile, 2-lane, 1-way network. It is known as the RHW-4 because the full width of both directions is 4 lanes over 2 tiles, but because it is based on a 1-tile network, the two halves of a full RHW-4 do not need to be adjacent, and can be split, to allow Variable Width Medians, unlike Maxis Highways (without the cumbersome Multi-Highway technique). It has twice the capacity of an RHW-2. Also unlike the Maxis Highways, the RHW-4 can have at-grade intersections with other networks, in addition to allowing for grade-separated interchanges using the Modular Interchange System (MIS) interface ramps. At-grade intersections, including diagonals, are possible with the Road, Street, Rail, GLR and RHW-2, along with Elevated Light Rail and Monorail overpasses. Drawing an orthogonal street on the inside of an RHW-4 causes it to turn into an Emergency Turnaround Lane. In Version 3.0, the elevated RHW-4 was added at 15m (L2) height, and Version 5.0 marked the introduction of the single-tile Double-Decker RHW-4 (DDRHW-4), with two decks at 7.5m (L1) and 15m (L2) height, respectively. The RHW-4 has the widest variety of possible height configurations, reaching up to L4 (30m). The RHW-6S, introduced in RHW Version 2.0, is just like the RHW-4, except that it has an extra lane per direction, and overhangs slightly beyond its physical 2-tile footprint. The capacity of the RHW-6S, with the NAM Unified Traffic Simulator, is higher than that of the RHW-4 beginning with the Version 4.1 release. Its only interaction with other networks is through grade-separated interchanges (with the MIS), and with Overpasses. Draggable diagonal functionality for the RHW-6S was implemented in Version 5.0. An Elevated RHW-6S at 15m height was also added in Version 5.0, with one ramp interface (a Type D1) and no diagonal/curve functionality. Presently, the Elevated RHW-6S exists in four height levels: L1, L2, L3, and L4, and is capable of many orthogonal and diagonal overpasses. The RHW-6C is a 6-lane, 3-tile network, added in RHW Version 3.0. Due to how it occupies its space, it is a "true" wider network, in that it adds capacity beyond the RHW-4 (and indeed, beyond the RHW-6S). Draggable diagonal functionality for the RHW-6C was partially implemented in RHW Version 4.0, and stabilized for Version 5.0. An Elevated RHW-6C at 15m height (without diagonal functionality, curves or ramp interfaces) was also added in Version 5.0. The NAM 31.0 release saw the expansion of the RHW-6C to L1 and L2 height, with some diagonal functionality. The RHW-8S is a "true" wider network, added in RHW Version 3.0. In its full form, it is an 8-lane, 4-tile network, with 4 times the capacity of an RHW-2, 2 times the capacity of the RHW-4, and 1.33 times the capacity of an RHW-6C. Draggable diagonal functionality for the RHW-8S was partially implemented in Version 4.0, and stabilized for Version 5.0. Elevated RHW-8S functionality was introduced as part of the Project 57 efforts in NAM 31.0, released in 2013. A 3-tile-wide RHW-8C also exists, having been added in Version 4.0. It has the same capacity as the RHW-6C and primarily exists simply for the purpose of adding auxiliary lanes to the RHW-6C. Draggable diagonal functionality for the RHW-8C was implemented in Version 5.0, and L1 and L2 RHW-8C networks were added in NAM 31.0. Interchange along a RHW-10, currently the largest RHW network. Trumpet interchange made with RHW 3.0. The RHW-10S is currently the widest RHW network, consisting of 10 lanes over 4 tiles. It has the same capacity as an RHW-8S, and thus, is more or less functional eyecandy. Draggable diagonal functionality for the RHW-10S was implemented in Version 5.0, and L1 and L2 RHW-10S networks were added in NAM 31.0. The Modular Interchange System (MIS) Ramps are the backbone of the RHW's interchange capabilities, allowing for draggable custom setups. The MIS is a 1-tile, 1-lane, 1-way network, allowing for connections to surface streets, and to other RHWs. In Version 3.0, Elevated MIS (EMIS) was added. At present, there are five levels of MIS: ground (L0), L1, L2, L3, and L4. Blue Lightning created an Elevated MIS Wide Radius Curve capable of over passing other RHW networks called FLEXFly. It was introduced in the Version 4.0 release, and expanded in Versions 4.1 and 5.0. There were further plans to revamp FLEXFly for the initial Project 57 offerings in NAM 31.0, implementing a new 5x5 footprint for the 90-degree curve, as opposed to the existing 4x4 layout, and additions of FLEXFly pieces for all height levels in the Multi-Height System, but due to the lengthy development process of that release, and lack of personnel led to this project being put on indefinite hold until NAM 33, which finally debuted the new specs. The old FLEXFly and FLEXCurve pieces from NAM 32 and earlier became inactive "legacy" items, and are not planned to be improved or developed further. The RHW-4 is sometimes used as a wider MIS ramp, and has occasionally been referred to as "MIS-2" in these situations. These networks have been proposed, and some have even had prototypes made, but they are planned for a future release. There have been proposals to eventually create "ultra-wide" RHW networks, extending out to either 16 or 18 lanes spread across two carriageways. Though the Project 57 specifications allot Instance ID ranges for several such networks, including an RHW-10C, RHW-12S, RHW-12C, RHW-14S, RHW-14C and RHW-16S, the Ultra-Wide RHWs have been shelved for the foreseeable future. This is due to the RUL size concerns arising after NAM 31.0, functional differentiation issues, and general complexity issues pertaining to the cross-linking of override networks. On June 5, 2011, Tarkus revealed the addition of the Double-Decker RHW-4 (DDRHW-4) with a YouTube video, which was included in the Version 5.0 release, 3 months later. Its two decks are at 7.5 meters (L1) and 15 meters (L2). The network was set up Rail-based to obtain a higher capacity, but later testing led to the discovery that non-roadway networks are restricted to the capacity of the Road network when carrying car, bus and freight truck traffic. To compensate, the DDRHW-4 was converted to an RHW-based network, with Distilled Intersection Paths to boost the capacity slightly. The DDRHW-4 decks had been at 15 meters (L2) and 22.5m (L3), respectively, prior to NAM 33. A DDRHW-8 is also planned for future inclusion, also at the L1/L2 height. No further DDRHW width or height variants beyond the DDRHW-4 and DDRHW-8 are planned. 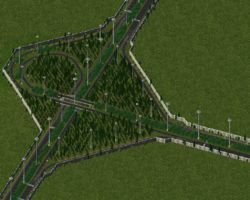 The Version 4.0 release introduced two new pieces to allow for the construction of ground-level Single-Point Urban Interchanges (SPUIs) and the Diverging Diamond Interchanges (DDIs). As demonstrated in a YouTube video by Tarkus, the SPUI has been converted to a "flex" system for Version 5.0, allowing much greater functionality and ease of use. The previous SPUI puzzle piece from Version 4.0/4.1 has been disabled and moved to a legacy support file. FlexSPUI is in somewhat of a transitional state right now, due to the fact that it has only been partially synchronized with the Project 57 updates that were introduced in NAM 31.0. This is still the case as of late 2015, following the release of NAM 34. Draggable Ramp Interface (DRI) functionality was also introduced in Version 4.0, and was expanded in Version 5.0 to encompass all networks except the MIS and the RHW-3. The DRI functionality later evolved into the FLEXRamp system, an overrideable and more slope-tolerant system, which is planned to eventually cut down on the number of requisite ramp interface pieces. Presently, as of NAM 33, most existing non-Fractional Angle ramp interface setups have been given a FLEXRamp and/or DRI treatment. Tarkus unveiled the QuickChange system on his YouTube channel in October 2013, which was designed to appeal to users who have requested pre-fabricated plop interchanges for the RHW, without compromising the modular design philosophy of the RHW system. QuickChanges are larger pieces of interchanges, built entirely using FLEX components, and designed in such a way that they can be used with any RHW network that supports FLEXRamps, and allow as many setups as possible with a single piece. To date, 4 QuickChange pieces have made it into the NAM, including ground and elevated Diamond Interchange and Parclo Interchange quadrant ramps. The FLEX-based design re-uses smaller, existing items that were part of the modular system, including height transitions and FLEXRamps, and avoids the AutoTileBase issue that restricted interchange size, allowing for larger pre-built sections to be readily implemented. A look at Version 2.0 with the Modular Interchange System (MIS) in a Multi-RHW configuration. Wider RHWs can also be made using the Multi-RHW technique first developed by Haljackey, which essentially involves putting two one-way RHWs (usually RHW-4 or RHW-6S) in the same direction, side by side. Although this creates 8 lanes (or possibly more) in each direction, the networks are still separate RHW-4s, and must be linked together to work properly. A Multi-RHW is a great way to make a collector/express system in SC4 that many real life highways use. Prior the Version 2.0 release, the Multi-RHW was possible, but very difficult to make due to the fact that the RHW-4 was built using a Side-by-Side Override. This would often result in some parts of the Multi-RHW going in opposite directions and was a pain to correct. With the switch to the starter piece system included with Version 2.0, Multi-RHWs can now be dragged without any worry of changing direction, making them much easier to construct. For more information about the Multi-RHW, see Multi highway. 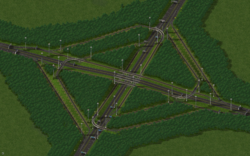 A large RHW interchange made with version 4.0 without tunnels. The first set of Euro textures was released by Shadow Assassin Euro Texture Set for RHW Version 1.3b, with a later update for Version 2.0. MandelSoft subsequently released a series of prop additions as part of his RHW Addon Mod, and has also released an RHW Euro texture set based on Tarkus' default North American set from Version 3.0, which was updated to an "interim" release coinciding with Version 4.0. Since NAM 31.0, MandelSoft expanded his texturing efforts to cover a wide array of road marking styles from the world, including Euro textures, and the NAM installer now includes these texture sets as options. With MandelSoft's shift of focus to games other than SC4, and the differences in texture specs, MandelSoft's RHW sets, including the Euro, Irish/South African, and Ontario textures, were phased out in the official release of NAM 33 in November 2015. A new standard Euro set, based on the default North American set specifications introduced in RHW 5.0, has been added in their place. 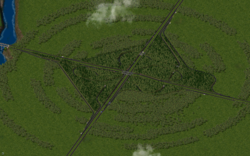 A large RHW interchange made with version 4.0 with a tunnel. This page was last modified on 6 July 2016, at 04:40. This page has been accessed 197,691 times.